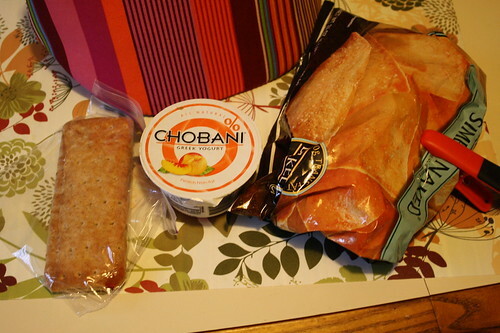 I’m behind on my blog again, but here are my eats from yesterday. I’ve had sort of an “off” week with food. 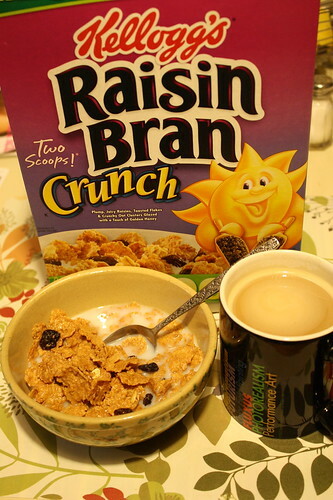 I don’t know if it’s our extreme weather changes from hot to cool, but I wasn’t feeling eating certain foods this week. 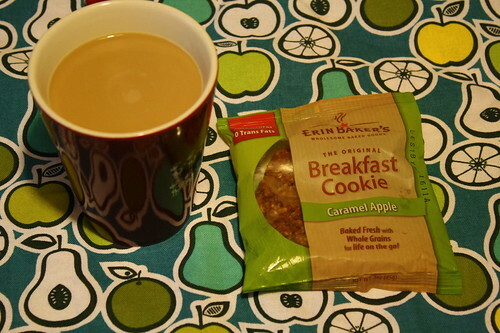 For example, on Friday, I didn’t feel like anything in particular for breakfast, so I went with what sounded good: the Caramel Apple Breakfast cookie I won from Living Lindsay. 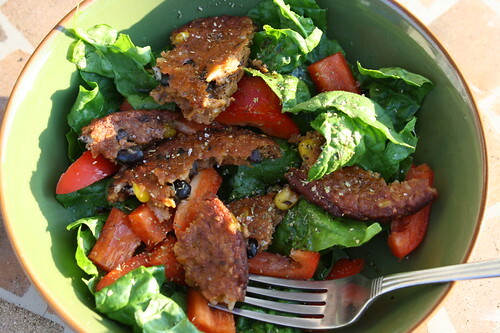 It was really tasty and filled me up! The one thing I was feeling all week was the need for iced coffee. I had it at work maybe every day. On Friday, I even caught someone stealing from the coffee stand while waiting for my coffee, so that was an interesting moment. One of those in which you wonder “is that guy really stealing that bag of popcorn or am I imagining things.” I gave him the benefit of the doubt at first and then I saw him trying to hide it. Luckily, he got caught because I told the guy at the coffee shop what I just witnessed, but not much could probably be done. 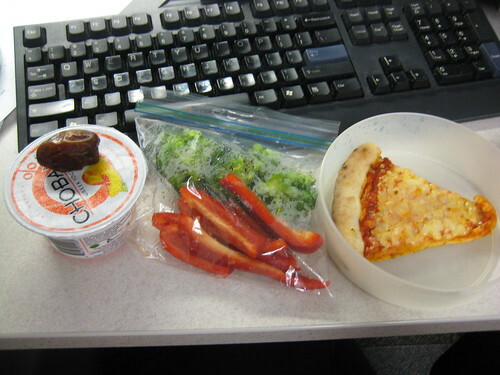 Lunch was a piece of Trader Joe’s pizza, a peach chobani, a date and red peppers and broccoli. I’ve been really good about getting veggies in my lunches this week. Love eating the broccoli and red peppers together simultaneously. I really felt like a Cousin’s sub for dinner, so of course Craig couldn’t say no to that idea. 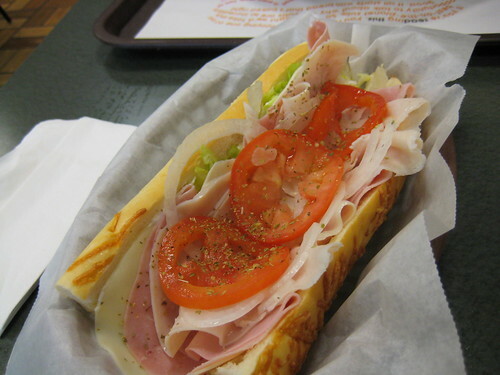 I got a club, my fav sub on Parmesan asiago bread. Last night, I watched Food Revolution per usual and took notes again. My favorite quote from Jamie about fast food was “It’s a treat, not a structure.” He helped a dad and his two sons break their fast food habit (hopefully). They were definitely treating fast food as a structure. The other cool way to teach about food to high school kids was when Jamie had them pick a snack. They could choose from an orange, soda, pizza and a chocolate bar. Once they ate their choice, Jamie took them outside and had them walk the track to reflect what they ate and burn off those calories. The orange eaters only had to walk 3 laps of the track where the chocolate bar eaters had to do something like 11 laps. Great way to teach about healthy food choices, huh? Ok, off to write a different post about today and then another about a fun health and fitness fair I went to on my lunch break on Thursday.